Continued from "Zeb-un-nisa, Jani, Lal Kunwar and Muhammad Shah Rangeela"
All members of the royal family did their share in the making of the new city. Tees Hazari, a spacious and imposing garden near the Kashmiri Gate, was laid out by the Emperor himself. Princess Jahan Ara, Shah Jahan's favorite daughter, laid out the Urdu Bazar near the Jama Masjid. She also built a large chowk with a big pool at the center, which came to be known as the Chandni Chowk. The canal built by Ali Mardan flowed through the main roads and also fed the pool at Chandni Chowk. “A canal flanked by the trees on either side ran at the centre of this bazaar, widening into a tank in the middle. On moonlit nights the canal and the pool were resplendent with the reflected glory of the moon. So the bazaar came to be known as Chandni Chowk, the moonlit square.” The canal was a real blessing to the people of Shahjahanabad as it supplied their drinking water. The rich and the nobility built their mansions here. Shops sprang up all along the Chandni Chowk that soon became the most fashionable locality in the empire. It was also a prosperous trade center where traders came from many countries. There were fruit shops selling choicest of fruits from Afghanistan and Kashghar; jewelers selling all kinds of gems and jewelry; shops selling hookahs; and shops selling different kinds of weapons. In short, they sold everything that was popular at the time. It might surprise you to know that transactions amounting to lakhs of rupees took place everyday. There is an interesting story mentioned in the memoir of Nawab Durgah Quli Bahadur about shopping in Chandni Chowk. A young noble who had just lost his father wanted to go shopping in Chandni Chowk and asked his mother if he might. His mother burst into tears and said, “Oh my son, your father has not left you enough money for you to go shopping in Chandni Chowk. But, since you want it so badly please take a lakh of rupees which is all I can spare. It will enable you to buy a few token gifts after you have seen the shops.” Just imagine! Some people actually spent one lakh rupees for buying just token gifts even in those days! Much later, in 1837 Emma Roberts, an English woman, writes in her diary that the Chandni Chowk often “echoed with the shrill roar of many caged cheetahs being sold and also hunting leopards. There were Persian cats and greyhounds for sale, while the trumpeting of elephants mingled with the sounds of cartwheels and itinerant musicians". 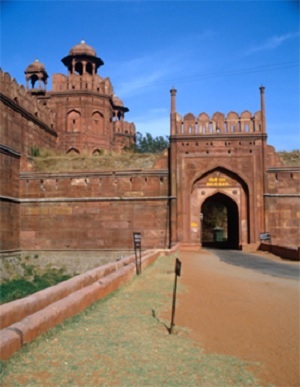 Two impressive gateways, - The Lahori Gate and the Dilli Gate, provided a finishing touch to the capital. The Lahori Gate that faced one end of Chandni Chowk, was really imposing with its splendid side towers and the great central arch. It led to the Chhatta Chowk or the Vaulted Arcade. The arcade had a central courtyard open to the sky. On each side of the arcade were 32 arched rooms. Fergusson describes this vaulted hall as “the noblest entrance known to any existing palace.” This place is now lined with antique shops, crowded close together. “Here sat the court jewelers, goldsmiths, picture-painters, workers in enamel, carpet manufacturers, weavers of rich silks (kincobs), and fine cloth for turbans and makers of pyjama-girdles, ornamented with gold and silver flowers, together with a thousand other beautiful and costly luxuries, adapted to the sumptuous taste of the most splendid court in the world." Menfolk were not allowed to enter the fort on Thursdays when the entire place was handed over to the women. The women guarded the fort and also took over the stores. This was the time when the queens and princesses and the wives and daughters of the nobles came here to do their own shopping. During that one day in the week the Red Fort was transformed into a women's market or the Meena Bazaar. The Son-et-Lumiere, a Sound and Light show held at the Red Fort every evening, describes the Meena Bazaar most effectively. You can hear Princess Jahan Ara shopping with her mother, the Queen. The princess wants to buy some glass bangles but queen tells her firmly that a princess or anyone who has royal blood does not wear glass on her wrist! The shopkeeper, who greatly admires the princess, begs the queen not to disappoint her beautiful daughter and allow her to buy the little trinket. The queen laughs and relents. Then she pays for the glass bangles in gold! Those of you who have been to the Son-et-Lumiere at the Red Fort must have heard the story. (The man whom fortune favors with residence in Shahjahanabad leads a happy life).